So far, China has managed to mark its words with actions. Everything appears to be going well so far with a series of positive signals released. Notable moves have been undertaken to respond to Trump’s trade gripes: reducing taxes on cars imported into the world’s second-largest economy; the revision and enactment of Chinese patent laws for intellectual property violations; a pledge to import more soybeans, rice, and other produce from the United States, and so on. Among the driving forces behind this progress, most proximate is that both countries suffered the broad pain of losing billion of dollars in 2018. Nevertheless, deeply embedded challenges remain ahead for bilateral relations, which may take more than 90 days to tackle and involve delicate diplomacy. First, the U.S. trade deficit with China actually continues to increase. According to the findings from Peterson Institute for International Economic (PIIE), the U.S. goods trade deficit with both China and rest of the globe is 10 percent higher today than it was in 2017, respectively projected to reach $413 billion with China and $879 billion globally in 2018, notwithstanding the administration’s punitive tariffs. A comprehensible explanation for that is that Uncle Sam might be the lone economic bright spot left as a result of the world’s economic quagmire. While China has been booming in recent years, its growth is slowing down too. Trump could use tariffs as a diplomatic cudgel to bring China and other trading partners back to the negotiating table, convince them to draw down their vast reserves of U.S. dollars, and thereby rebalance international exchange rates temporarily by March. But there is little he can do to fundamentally erase the trade deficit within such a short period of time, not only because it would require cutting to the heart of China’s economic model, but also owing to an uncontrollable status quo in the systemic environment. Second, as opposed to progress in trade, the risk of technological confrontation between the United States and China is starting to come together. The arrest of Meng Wanzhou, the chief financial officer of Chinese tech giant Huawei, is a solid example. 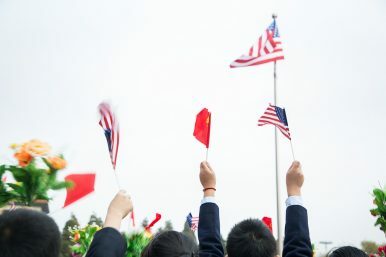 It has Chinese officials questioning whether the United States is negotiating in good faith, which might potentially result in a widened rift. A report from Danske Bank, the largest bank in Denmark, argues that there is “improvement in trade war, deterioration in tech war.” While both sides are keen on progress on the trade front, the Sino-U.S. relationship is embarking upon a new level when it comes to the ‘tech war’ and cybersecurity. While Huawei exemplifies the successes of Chinese globalization, its technological advance with artificial intelligence (AI) and 5G does terrify the West, which worries about China’s political ambition and the practice behind it. In fact, the West, especially the United States, is supposed to balance fretfulness about security with confidence that global trade plays a constructive role for our prosperity and peaceful relations. Not only factors from the outside, but internal characteristics of states intervene in their leader’s assessments as well. Trump currently is facing significant challenges to his trade agenda at home. Due to different interests, perceptions inside his administration toward China have wound up with notable divergence. Execution on further trade talks therefore is torn between two camps. Doves such as Steven Mnuchin, the treasury secretary, favored previous offers by China to buy more energy and agricultural products from the United States, saying that “they could further delay an escalation in tariffs if the two sides made sufficient progress.” Hawks — the U.S. Trade Representative Robert Lighthizer in particular — long for deeper changes, demanding that China pause alleged practice to steal technology from America. And new reports unveil that he left no wiggle room for the two countries to extend talks beyond 90 days. This month it emerged that the March 1 “hard deadline” was endorsed by Trump. This consequently lead to the failure of a meeting between cabinet-level officials in the first half of the 90-day period, making the rest of the session stacked with more urgency and perplexity. Furthermore, Trump’s personal hallmark in diplomacy is also a big hassle for the trade talks. His habit of on-the-spot decision-making has been described as “immediately satisfying but damaging in the long run.” Once Trump notices that trade talks are not sufficient enough for him to eliminate the trade deficit, it is possible that he will seek another alternative of alleged “punishment” for China at will — cybersecurity might be included here. Incontrovertibly, the outcome of Sino-U.S. diplomacy within the foreseeable future will depend less on the pressure generated by the international system than on how well the two leaders manage the situation. It would be a good start if the United States and China can be expected to institutionalize and normalize this sort of summit as a mandatory mechanism prior to taking actions, to minimize risk of misinterpretation from each other. In a sophisticated framework for managing competition, they could handle acute affairs, including the South China Sea and cybersecurity, insofar as they can control them, without worrying about overflow to all-out adversarial relationship. But that might be saved for later. At least the U.S.-China trade cliffhanger is not over yet in 2019. Placating the other side in two months will be an uphill battle. The tough road to a more comprehensive deal could be seen in the divergence. When the skeptics clamor for more, how to prove that the actions being taken are more than cosmetic changes to an economic system may be one of the top concerns. If they are not able to solve the challenges, the two countries will not be scheduled to make a large-scale breakthrough then. Dingding Chen is the founding director of the Intellisia Institute. Junyang Hu is a research assistant at the Intellisia Institute in Guangzhou, China.